The new year is a great time to take a step back from your business and assess your goals for the year ahead. How will you challenge yourself to keep up with the latest digital trends in 2019? 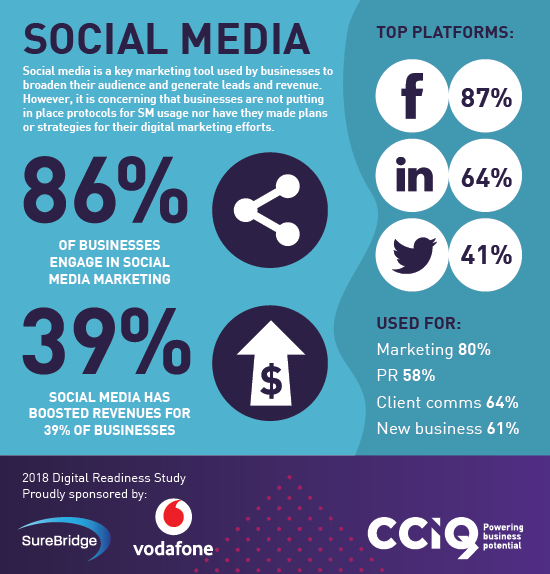 A recently conducted Digital Readiness study by the Chamber of Commerce and Industry Queensland (CCIQ), sponsored by Vodafone and SureBridge, looked at the digital trends of small businesses in Queensland and the areas that arose as opportunities in the digital space. The great news is, most businesses are very optimistic about the future of digital and how technological advancements can help them, with 89% of businesses surveyed responding that they were optimistic about adjusting to digital business opportunities. However, 90% of businesses thought they should become more digitally savvy. The good news is, there are plenty of simple steps you can take to lead your business into the future with technology. Many businesses are starting to make the move to computing based on the internet, otherwise known as cloud computing. The benefits of cloud computing include automatic software updates, increased collaboration, the ability to work from anywhere with an internet connection, and reducing the cost of hardware. In fact, CCIQ’s 2018 Digital Readiness Study found that there has been a significant uplift in businesses moving to a third-party server hosting facility – now 45% of businesses are using off-site data centres, compared to 29% in the 2016 Digital Readiness study. Around 78% of businesses surveyed are also using cloud-based software applications. As costs are coming down for these platforms and internet speeds pick up, we could see even further adoption of these in the future. If you’re not already using cloud applications, a good place to start could be using platforms like G Suite (including Gmail, Docs, Drive and Calendar for businesses) to collaborate on projects. If you haven’t already, it’s definitely worth checking that your website is mobile optimised. According to a 2018 Nielsen study, Australians who are 18 and over are now spending over double the amount of time per year accessing online content on their mobile phones rather than on desktop (51 hours on mobile vs 24 hours on desktop). Despite the fact that there has also been a 15% increase year-on-year of online purchases via mobile devices (Deloitte Consumer Survey 2018), many businesses still haven’t ensured that their website has a seamless mobile experience. In CCIQ’s 2018 Digital Readiness study, 71% of businesses responded that they had a mobile optimised website – and this number is on the rise (up from 60% in the 2016 survey). If you’re yet to join the trend, one easy place to start could be updating the mobile SEO for your business. You should also consider updating the mobile user experience of your website – it could be a great investment for your business in 2019. While a free email provider may have done the job at the start of your journey, once you expand your business, your needs may change. Since the 2016 Digital Readiness report, more small businesses have started moving to business grade products (from 18% to 30% in 2018). Business grade email providers such as Office 365 Business and G Suite offer tiered business options that allow you to access more features and accounts for your employees. Other advantages of moving to a business grade account include using your web domain as your email address and getting better access to security features to protect your data. In 2018, many small businesses reported seeing a boost in revenue and increased business opportunities from using social media to promote their business. In fact, 39% of the small businesses surveyed responded that social media had boosted their revenues (compared to the 2016 report, where only 29% thought it had a positive impact on revenues). Social media is a fantastic channel for marketing small businesses, as it is one of the few one-to-one channels where you can get direct feedback from your customers. For more information on how to get started, check out our handy guide on where to start when creating a social media strategy. If you’re still keeping paper-based data about your clients and prospects, it could be time to invest in a CRM (customer relationship management system). There has been a huge uptake of CRMs in the past couple of years according to the Digital Readiness study, with 61% of businesses surveyed using a CRM, compared to just 30% in the 2016 survey. Using a CRM allows you to keep all your customer and sales data in one place, and helps increase team collaboration in your sales team and build better client relationships. They also give you access to better analytics and reporting tools, so that you can understand your customers better. There are so many opportunities to adopt new technologies in 2019. 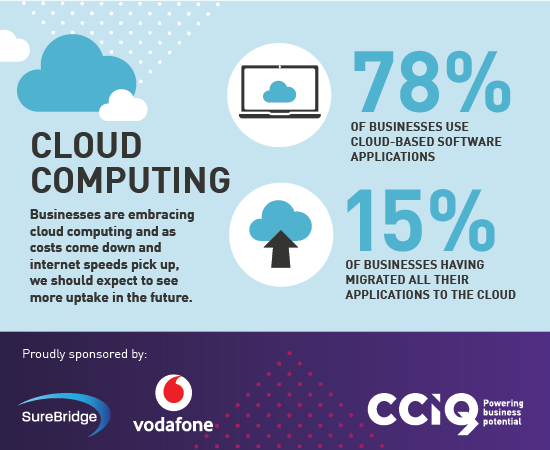 To find out more about current digital trends for small businesses, download the full CCIQ 2018 Digital Readiness survey. As an advocate for small businesses, Vodafone Business is here to help. Check out our suite of ReadyApps, talk to one of our sales representatives, or sign up in the form below for a call back to find out more about how we can help your business.